St. Peter´s Congregation was organized in 1902 for the Pittsburgh Diocese. The Bishop of Pittsburgh, Rev. Richard Phelan, was very interested in the Italian Catholics and was responsible for no less than seventeen parishes to be organized. The first of these was the one erected in New Kensington. This new parish was named St. Peter because until that time, the Italian people of the area were under the spiritual guidance of the Italian Friars Minor who were in charge of St. Peter´s Church in Pittsburgh. The people adopted St. Peter, the first Pope, as their patron saint. By 1903 the new parish had its first resident pastor and a place to worship - the corner of Second Avenue and Tenth Street. 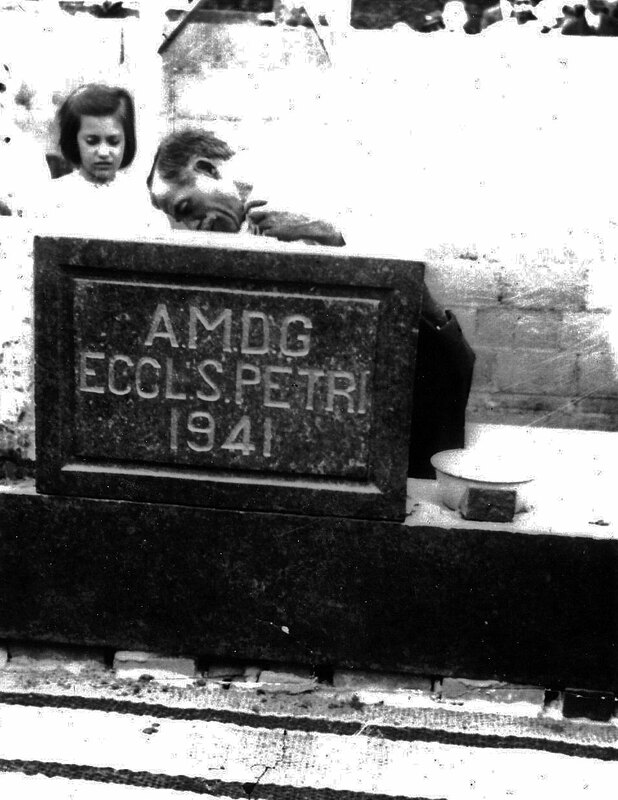 Later in the year the congregation moved to the basement of St. Mary´s Church on Kenneth Avenue. Then a piece of land on the corner of Ridge Avenue and Constitution Boulevard (across from the YMCA) was donated to the church by the Burrell Improvement Company. 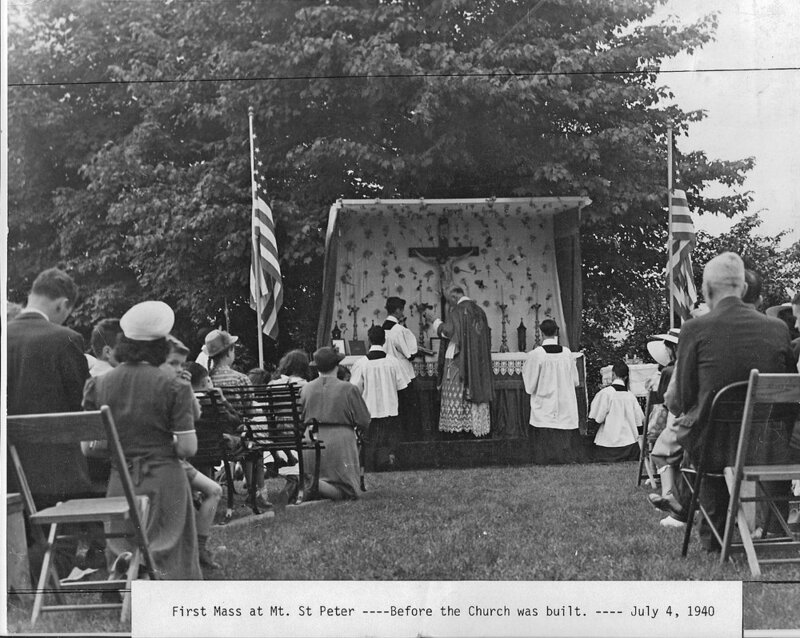 On July 4, 1904, the cornerstone for the first St. Peter´s Church was blessed. 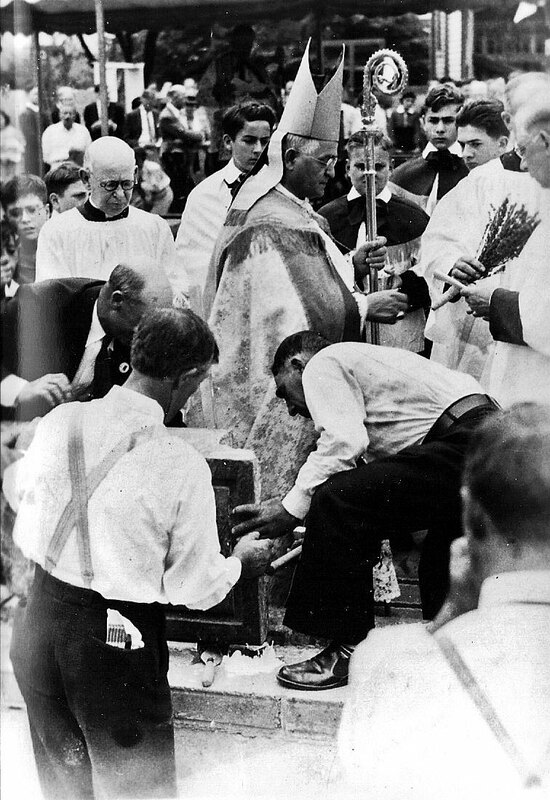 Bishop Regis Canevin formally dedicated the new church on September 25, 1904. It is interesting to note that in 1903 the monthly salary of the Pastor was $35, which was cut to $30 in 1904. The kitchen furniture and equipment cost $7.23. Furniture for a bedroom, office and dining room cost $74.89. The altar stone, sacred vessels and vestments were donated by another priest. Many priests came and went during those early days. They did their own cooking and washing. They traveled on horseback to say Mass at another church. They were threatened and shot at. They did not know the English language, but in spite of that handicap, they were able to achieve what they did for the Church . We owe a great deal to them. These men of God saved the faith of our Italian immigrants and sent it down to us. On September 7, 1923, Rev. Nicola Fusco was appointed Pastor. He was born in Italy and was brought to the East End of Pittsburgh early in his life. He was always devoted to the arts and architecture of Italy and the Church. He was educated at the College of the Archabbey of St. Vincent at Latrobe, Pennsylvania. Who could have foreseen that his love of art and architecture would be so invaluable in building of our beautiful Mt. St. Peter. The new Pastor and his assistants took the church to the people. They went to Logans Ferry, Barking, Glassmere, and then to Braeburn. St. Peter´s continued to grow and by 1937 Confirmation had to be administered twice because the Church could not hold the class at one time. It was apparent that a larger church was necessary. Reference: Mt. St. Peter, 1944, 1970 Nicola Fusco, Guideline Printing Co., Springdale, Pennsylvania. Greensburgh Tribune-Review, James D. Van Trump, May 19, 1985. Until 1902, the property whereour Mount St. Peter's stands was owned by Stephen Young. He was a General during the Civil War and friend to Abraham Lincoln. The next owner was Frank M. Curtis who purchased the property for $7,000. He sold it in September, 1914, to Davis A. Leslie, a pharmacist, for $17,000. This four acre tract of land was known as the Young Estate and the large mansion on it was called "The Knoll." What a perfect site for a church! Early in 1938, Mr. Leslie was approached about our interest in the property. He said, "When you have $35,000 come here and we will close the deal." THis seemed an impossible dream . . . we did not know the "will of God." Mr. Leslie died on August 25, 1938, and our dream seemed to be shattered. Our need for a larger church was great. The congregation numbered about one thousand (1,000) families and the church could only seat about 200 people. Already the original church, which was at ground level, had been raised to add a hall underneath. In September, 1938, a campaign for a building fund was opened though we did not know where a new church would be built. Our prayers were answered in November when Mrs. Leslie sent for representatives of the church and offered to sell the property for $25,000. They offered her $20,000 and she told them that was an insult. Mrs. Leslie met with them again and on December 1, 1938, they paid her $500 hand money and took an option on the property. The Building Fund Campaign was re-opened and canvassing of the Parish was begun. On April 1, 1939, Mrs. Leslie vacated the Mansion and St. Peter's Congregation took possession of the estate which was at once called and still is called "Mount Saint Peter." Weekly card parties were held in the Mansion to raise money for the new church. A donation of 50 cents included coffee, donuts and cards. Mt. St. Peter, A Family Tradition, 1903-1981, 1981. The shell of the new church, when completed, appeared to be a Norman structure with massive walls, round arches over recessed doors and windows. This is blended with the Modernistic. The windows are 22 feet long and 2 feet wide - a decidedly modernistic treatment. Many famous churches of Europe often waited several generations before they were completed. It happened that they were begun in one style of architecture and finished in another. Several of them were started in the Gothic style and ended in the Romanesque style. The Red Michigan sandstone of the outside walls is rock faced. This is the same stone used in the Smithsonian Institute building known as the "Castle" in Washington, D.C. Some years ago this building suffered some damage and Mt. St. Peter's was able to supply some replacement stone. The main part of the church is 157 feet long, 55 feet wide, and 35 feet from floor to ceiling. Here also there is another blending. This was intended to have a medieval look. The granite wanescoat, the arches over the rear of the main altar and over the altar show this tendency. Then the flat panelled ceiling was adopted. The ceiling panels, which were on the second floor of the mansion, were placed above the Sanctuary. It was not expected to go any further, but the people insisted that the same ceiling be all over the church. A mold of the original panel was made. From this mold, over 300 plaster panels were made, painted by men of the parish, and put in place. The arch in back of the main altar was originally meant to be the frame of a huge stained glass window. It served that purpose in the mansion. When the window was half done, it was evident that it would be the whole show in the church so it was walled up. With the window now eliminated, there was an opening above the main altar, 29 feet long, 10 feet wide, and 15 feet high. In the main lobby of the mansion, there was a sumptuous mantle carved in statuary marble. The quality of marble was the same as that in the segmental arch and both carried the same decorative motif. The mantle was turned into an altar and it was erected within the arch. Three statues representing the Crucifixion were placed on the altar. The main altar is built on the same order as the altar in St. Peter's in Rome. The mensa, or top of the altar, stands in the middle of a square platform accessible from all four sides. The mensa has the form and appearance of a sarchphagus in which the martyrs were buried and upon which Mass was offered by the early Christians. The panels in the altar represent the vine and grape, the wheat and snake - symbols of Christ. The four columns of Riviera marble which support the baldachin came from the lobby of the mansion and the bronze panels in the baldachin were part of the grand staircase. A huge bronze chandelier in the recreation room is now the crown over the baldachin of the altar. The beautiful pilasters of French Rose marble and the large panels of Vermont marble in the Sanctuary were in the Mellon's vast lobby. What was the railing around a swimming pool is now the parapet on the rear balcony. The two marble angels at the bottom of the stairway have become holy water fonts. The beautiful sculptured alabaster bowl once filled with electric light is the Baptismal font. The massive granite balustrade around the terrace is our Communion rail. The large swinging doors of the dining room in the mansion were placed as panels in the entrance to the Chapel of the Seven Sacraments. The carved wood of the library went into making of the Confessionals. The letter "M" that was carved into the wood can be seen around the framework of the doors. The many cabinets of the vast kitchen are now in the church sacristy. There was a wealth of material which had come from the Mellon mansion. How some of the items were used in the construction of the new Mt. St. Peter's Church has been described here. Further editions of the Barque will contain additional information. Reference: Mt. St. Peter, Nicola Fusco, 1944, 1970. The building of the Rectory was begun in late 1944 and continued until early 1948. During the winter months though, when the weather did not permit outdoor work on the Rectory, the men worked in the basement of the church. Of couse we all know it as the Marble Hall. The Marble Hall measured 125 feet by 55 feet. Originally at the kitchen end of the hall, a platform was constructed on which was erected a magnificent marble altar. The Marble Hall was used as a lower church with Mass celebrated there on Sundays and other occasions to take care of the overflow from the upper church. It was said when the Marble Hall was finally completed, the result was comparable to an ancient Roman Basilica and the workers said that it was lucky that this was not completed before the church or the beautiful upper church would never have been built. As noted, the Marble Hall project and the Rectory were being worked on at the same time. For a few years Mt. St. Peter retained as a Parish House, the Leslie Mansion, which stood on what is now the Oval. It was a frame building, over 100 years old, with few rooms, poor living accommodations and a water pump at its main entrance. It was most uncomfortable for three (3) priests and a housekeeper. When construction of the new Rectory began, there was no architect and no contractor. The people borrowed a bulldozer from the John F. Casey Company of Aspinwall, and a steamshovel from the Burrell Construction and Supply Company of New Kensington. They proceeded to dig the foundation for a two-level building. The only technical advice they had was from an Engineer, Frank Recco. The cinder blocks were bought for eight cents ($0.08) each. The flexicore slabs, used for the floors and roof, were made by the young people of the congregation at the Burrell Construction Company, and here on the grounds of Mt. St. Peter´s. Free flexicore forms were gathered from Dayton, Ohio, free cement from Burrell Construction and free bricks from an abandoned brick yard at Valley Camp. After three (3) years of hard work, a three-story building was blessed, which is now Mt. St. Peter´s Rectory. The lower level houses the kitchen, dining room, laundry facilities, some work area for the office and storage areas. The garages and maintenance workroom are behind the Marble Hall. The church offices and a large living room/dining room combination are on the first floor. Our priests´ quarters and guest rooms are on the second floor. During the 1970´s, a renovation and updating of electrical, plumbing, heating and the addition of air conditioning was done. A few changes were necessary but with the commitment and the hard work of our people, the beauty of the Marble Hall and Rectory was enhanced. Reference: Mt. St. Peter, Nicola Fusco - 1944-1970.